UPDATED: New full-size image downloads are included for the Sony A350, Canon 5D and Pentax K20D at a constant f4.0 at all ISO settings. Crops on page 6 are now actual pixels with no size reduction and were extracted from the updated images. When Sony secured victory for Blu-ray a couple of months ago, it was difficult not to reflect on the Betamax vs. VHS battle that Sony lost many years ago. Those around at the time will remember that Betamax was the superior format but VHS won with licensing, availability, and lower prices. The Blu-ray victory was quite a contrast - this time being promoted by Sony who secured the exclusives they needed to assure Blu-ray the winner. As with VHS, however, it appears in the short term that the inferior format won again as Sony is only now introducing features to Blu-ray playback that were introduced with HD DVD almost two years ago. Those who review technology often see less capable technologies win based on dollars thrown into promoting a product and buying distribution channels. Why does this matter in the Digital SLR market? It doesn't as far as DSLR reviews are concerned, but it does put into perspective the fact that Sony is a massive player in the electronics arena, and Sony plays (and pays) to win. When Sony absorbed Minolta it wasn't long until the A100 launched the 10MP (megapixel) wars, even though the A100 was in reality a Minolta 5D upgraded with the new Sony sensor. Great things were expected after this first foray, but it took Sony quite a while to begin putting their stamp on the DSLR market. Last October the A700 prosumer Sony launched with a new 12.2MP CMOS sensor and 5FPS burst speed in a rugged magnesium semi-pro body. The A700 is still based on the Minolta 7D digital SLR but it is more "Sony" than the A100. This was followed at January CES with the A200 update to the A100 - now targeted at a street price of $599 with a kit lens. A month later at PMA, Sony surprised the market with two more entry level digital SLR cameras that feature what we found to arguably be the best Live View in any SLR. No one else in the DSLR market has introduced so many new cameras in such a short period of time. There are now Sony entry models at $599, $699, $799, and $899. The A700 is $1399 to $1499, and Sony isn't finished yet. A new Pro level 24.6MP full-frame (presumably to be called the A900) will launch later this year. New Sony DSLR cameras are everywhere, and to their credit, Sony has found ways to differentiate the three entry models. 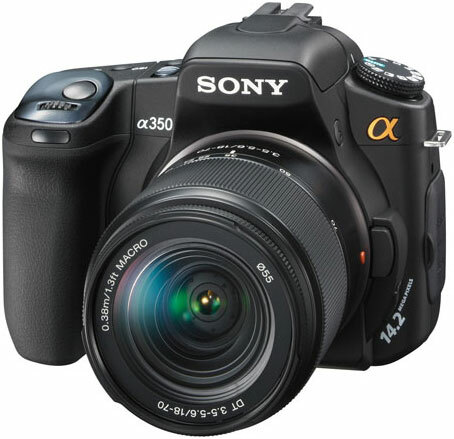 The A200 shipped about a month ago, and today we are taking a first look at the top entry-level Sony called the A350. It is the only entry-level SLR with a huge 14.2MP sensor, but unlike most recent DSLR sensor introductions, this one is CCD and not CMOS. The A350/A300 are also the only entry DSLR cameras with a tilt LCD. This is coupled with fast AF Live View, which moves that feature to a full-time view alternative with fast auto focusing. Most of the recent DSLR cameras feature Live View that was pioneered by Olympus, but Sony takes the feature from checklist novelty to a truly useful viewing alternative. This makes the transition easier for point-and-shoot users accustomed to Live View composing with the LCD screen. I find it odd that you would test cameras using printed matter as sample subject. Like digital images printed matter (esp. 4-color process) has its own errors that will (IMHO) negatively effect the photographic results. You should also consider the text of the review before making snide comments. The review indicated all camera white balance settings were set to Tungsten. If one camera or another has a warmer look than another, that's the "fault" of the camera. The issue of the image comparisons was noise, not color accuracy. The auto-teleconverter is convenient, but it is really just a crop of the 14.2 megapixel image. You can do that by croppping images from any digital camera. I was also disappointed that the auto teleconverter does not work in Live View mode. Briliant Wesley ... THIS is that kind of information that should have been in the review !!! That's also what I meant in my earlier post. Camera handling and the little quirks that either get in the way or aid in actual shooting. also they sell fer around 30$ on amazon.